There are only so many ways that any system can be protected. Encryption is one method but just using encryption isn't enough. 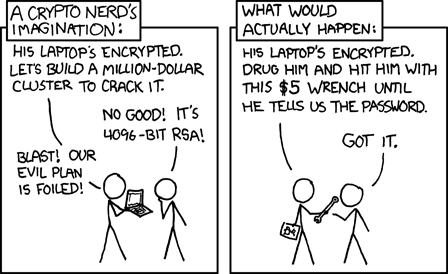 Using encryption is easy, using encryption correctly is hard. I had an idea in 1998 that I finally found a use for after recent events around seizures of Tor Onion sites. I dusted off this personal project in 2014 and my prototype still works!!! In 2015 I plan to complete what I plan to call something like the "Torduckin Rubberhose Virtual Machine Deployment System". I'll work out a cool sounding acronym later. * Every MagusNet Torduckin Anonymous Proxy VPN virtual machine will be deployed from a central encrypted database using an SSH connection through Tor. * After launch, the virtual machine will look up it's configuration via an SSH connection through Tor. * Every 4 hours the whole process will kick off again without any human interaction.